In this first issue of 2018, savour the exclusive preview of the new collection of men fashion from the best fashion designers in Second Life! Find that special piece that speaks your inner god and wears it proud! We are proud to present you the exquisite work of our stylists and photographers, presenting a collection of pictorial stories artfully crafted to tickle your imagination. Enjoy a sneak peek of places to visit and explore featured in our Editorials! On our cover, we have the skin creator ‘machine’, artist-designer, Gac Akina! This illustrious young man burst onto the scene with a myriad of skins for men and continues to make you the most realistic alluring handsome looks to apply to your heart’s content. You will be spoilt for choice when you visit his shop Stray Dog. As always, remember to visit our participating Designers’ stores to pick up the Readers’ Group Gift they have specially prepared for you! Remember to Join the L’homme Reader Group : – in WOrld GROUP. 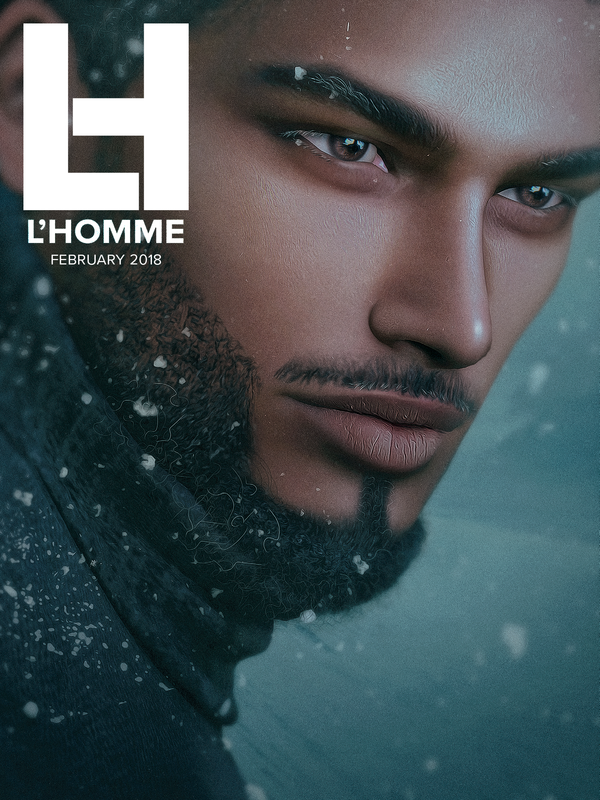 Remember to join our L’homme Magazine Fashion Show on the 4th February @ 9am SLT @ Fashion SHOW! !